Natural rubber 'fingers' scrape and trap dirt. Easy clean - shake out or hose down. An effective way to keep your entrance free from dirt is by removing it from shoes at the front door. Our rubber stud entrance matting has natural rubber 'fingers' that scrapes and traps dirt that is on footwear, helping to keep your floors clean. The slip resistant base prevents it from moving and causing a slip hazard, while the bevelled edges create extra safety reducing the chances of someone tripping on the matting. They are easy to clean by shaking out the dirt or hosing down the mats when a deeper clean is require, this ensures your premises maintain a high standard of cleanliness. They are available in a choice of four sizes; 600 x 800mm, 900 x 1500mm, 800 x 1000mm or 900 x 1800mm. 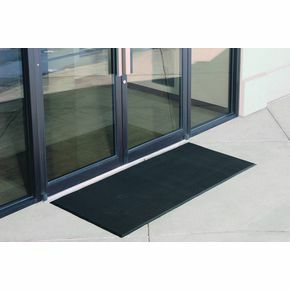 Our rubber stud entrance matting provides you with a simple solution to keeping your premises free from dirt often tacked in by shoes and other footwear.